… University that is, the last assignment was handed in yesterday. With the afternoon now completely free, myself and Ciara headed up to RSPB Campfield Marsh, in search of the reported Spoonbill. On arrival, scanning the large salt marsh pool, where it had been present only 20 minutes prior, it couldn't be seen, instead Mute Swan, Shelduck, Mallard, and a couple of Teal. Heading up the track to the main hide the above Willow Warbler happily sat in the open, staring us out at the sound of the shutter. On reaching the main hide Ciara picked up the Spoonbill almost straight away, right on the far side of the pool, although you could still see that it was a dapper bird. Curlew, Black Headed Gull and Lapwing were also present. Following the track back we picked up a Sedge Warbler singing, my first for the year. The same evening we headed down to the Badgers, have a look HERE. 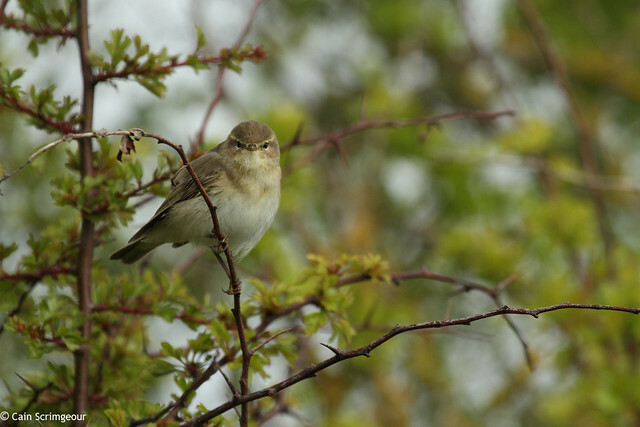 Very nice Willow Warbler. Now that the last assignment is done you'll have time for birding. :-) Cheers Brian. Congrats on getting back your freedom, lol! Sounds like a canny day at Campfield too! A nice way to celebrate, lol. Cheers Mark, the Spoonbill was a stonking bird, Campfield is a great little reserve. Cheers Cain. Yeah it's fab getting the Spoonbill! I think Campfield has picked up quite a bit since I was there a few years ago.